Dishwashers are designed to sit below the countertop and typically come with hardware to mount to the underside of the countertop, to the kitchen floor or to the cabinets adjacent to the dishwasher. 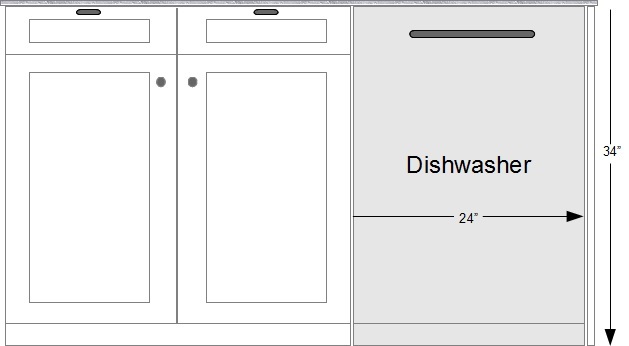 Most dishwashers come in a standard size of 24 inches wide, 25 inches deep, and approximately 34 inches tall with adjustable legs to set height according to needs. Integrated panel dishwashers, which are designed to look like a normal base cabinet with a cabinet front, are slightly shallower and are about 24 inches deep. If purchasing a stainless steel dishwasher look for "no-fingerprint" stainless to minimize cleaning and unsightly fingerprints and consider a dishwasher with the silverware rack built into the dishwasher door to maximize capacity.